The next Civic Service is the Court of Common Council Service on Thursday 25th April 2019 at 11:30am. This is an annual service before the first Court of Common Council of the financial year, as a way of asking God's blessings and guidance to the Common Council members as they undertake the Corporation's businesses throughout the year. All are welcome to join us. St Lawrence Jewry is the official church of the Lord Mayor of London and the City of London Corporation and stands in the Yard of the Guildhall. 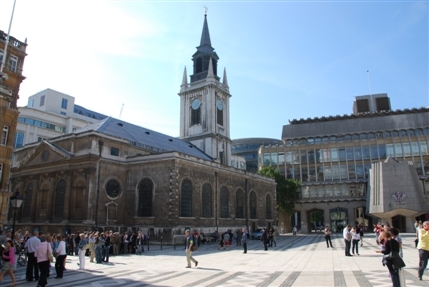 It was re-built by Sir Christopher Wren after the Great Fire of 1666, but there has been a church on the site for around 900 years. After extensive damage in the Second World War, it was again re-built. We are here to show the love of Christ to those who live and work in the City of London, and we seek to be welcoming to the many people who pass through our doors. The church is open from 9am to 5pm, Monday to Friday. Come and visit us soon. You will find a fascinating building to look round, and somewhere to stop, be still, think and pray; a place of tranquillity in an area of world commerce and business. We have a number of resources to aid you in this. For more information read about the Royal Marines Chapel. Our main services of the week are Holy Communion on Wednesday mornings from 8:30 - 9:15am and Friday lunchtimes from 1:15 - 2pm. Everyone is welcome to attend these services, which take place in the Commonwealth Chapel. The Court of Common Council Service is on Thursday 25th April 2019 at 11:30am. All are welcome to join us in these services. To know more of what's this service is all about, please visit our Court of Common Council Service webpage. The Vicar, Canon David Parrott, can be contacted at the Church (address below), by telephone 02076009478 or by email. You can find us on this map. We are part of the Diocese of London in the Church of England.